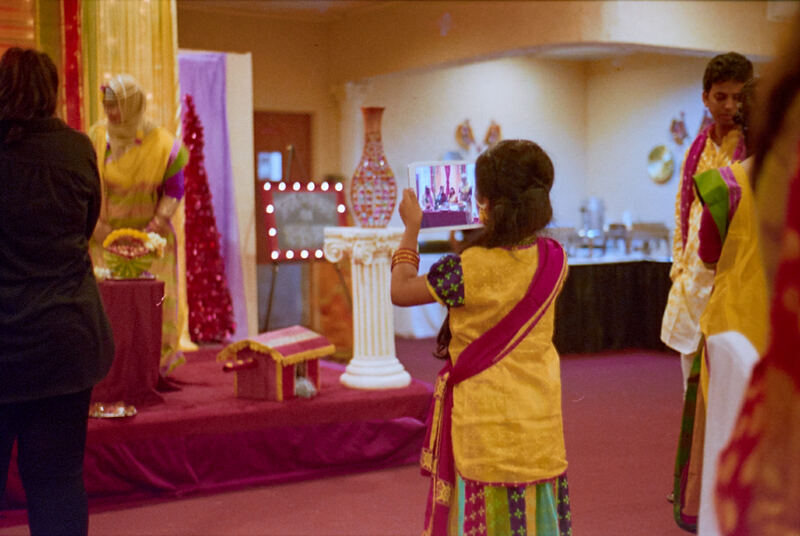 From the perspective of a total outsider, a Gaye Holud—literally “body turmeric” and more accurately ‘turmeric on the body’—looks like some sort of roast of the bride (and groom), but it’s not that at all, really. In traditional Gaye Holuds, on the night before the wedding (or a few days before) the groom’s family, minus the groom, visits the bride to welcome her into the family. They present gifts and pamper the new daughter in law. In more modern times, grooms started to turmeric parties of their own, and joint turmericings are also common. 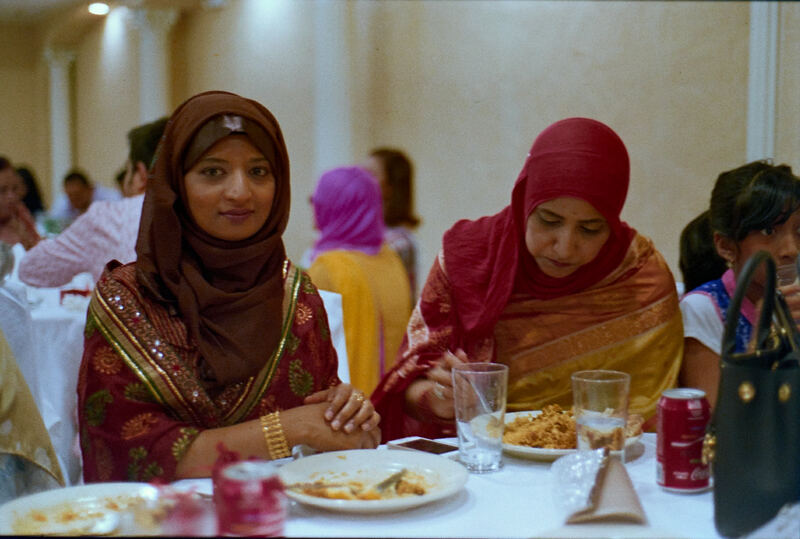 Rumman and Lisa held their Nikkah (Islamic wedding ceremony) earlier in the day, and Lisa and her family were in from out of town, so they held a joint event. 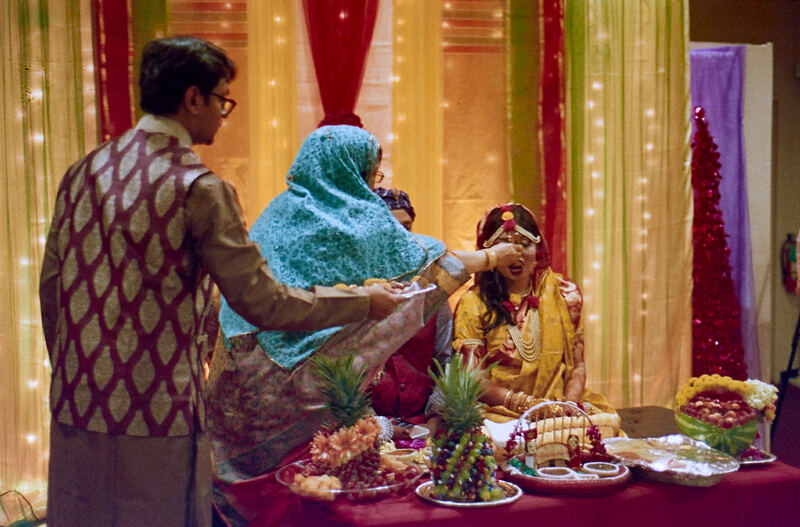 In a Gaye Holud, the bride and groom get treated like some sort of strange royalty: they sit on a daius while guests coat them, more or less, with turmeric paste (to clean and soften the skin) and feed them sweets and fruits by hand. There is much teasing and joking around involved, and the atmosphere is intended to be joyous and light. It’s really a good time, and I expect it would’ve been much more enjoyable for me if I had known more about it. Everyone dresses up in colorful attire (someone should’ve told me: I went in a brown kurta and khakis), and my wife looked lovely, as always. 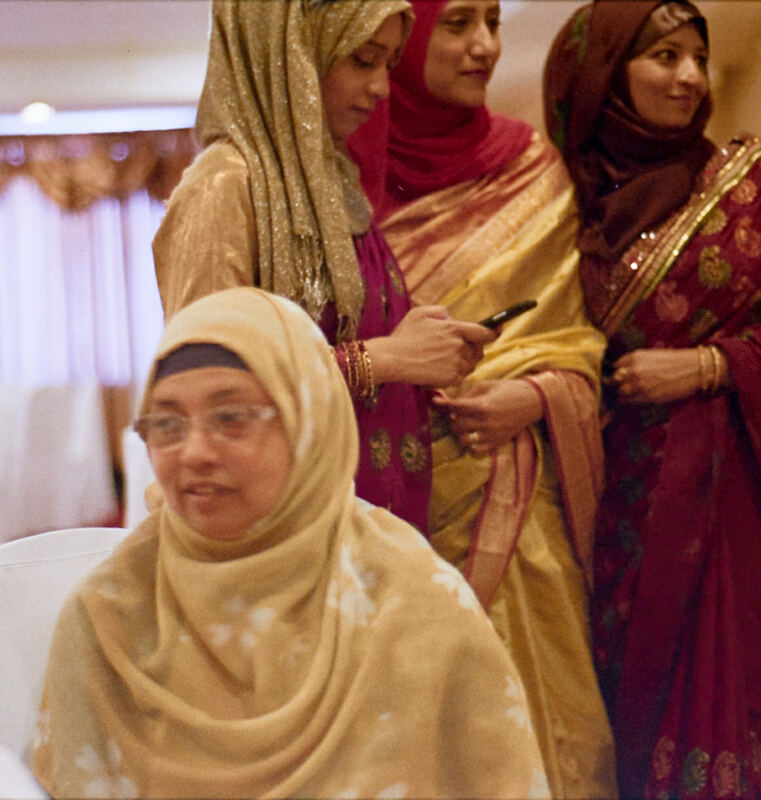 According to the invite, the event started at 6pm, and we arrived about 6:15 and found my in-laws—Amma, Abba, Fami, Thahmina, Sara, Sareena, Daniyal, and Fatema—already there. The professional photographer was hanging out in the corner, probably wondering where everyone was, and there were also a couple of the employees standing around, wondering why anyone was there so early. The tables were set up, but that’s about it. We really should’ve known: many/most parties in this culture start 2-3 hours after the stated time. I’m not sure why, but almost every party I’ve been to goes this way: it’s one of those things we get to learn about one another. So we realized that we had some time to wait. Luckily, most of our phones were fully charged, btu still, most everyone was a bit hungry and rather bothered by just sitting around. I tried to make the best of it by cracking jokes and taking pictures of the family, but I can only go for so long. 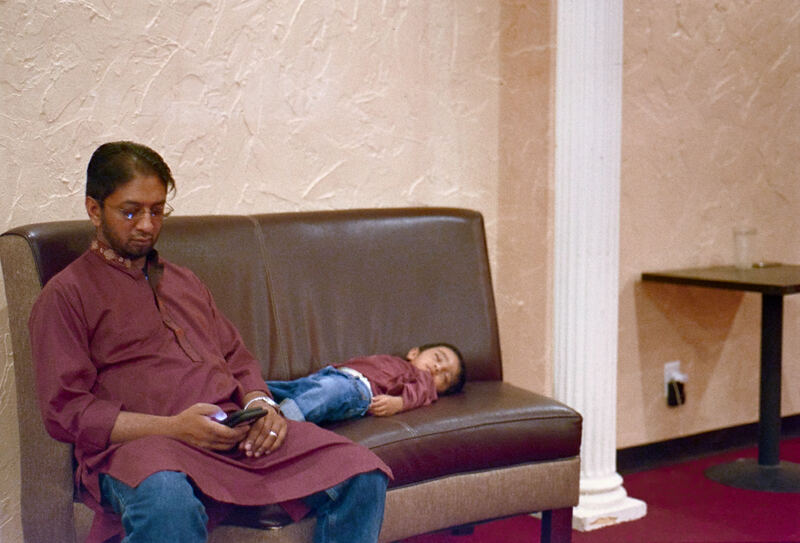 I got a couple of great shots of Abba, my father in law, and some cute ones of Samie and Daniyal. 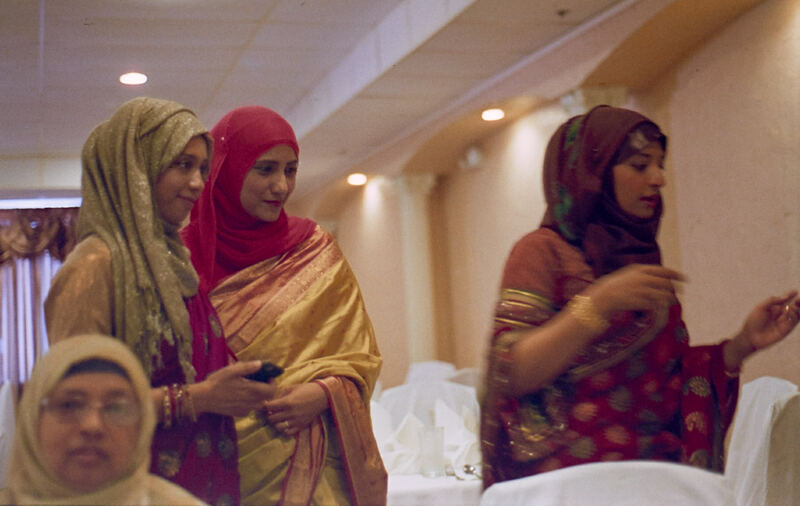 And I got some nice ones of Amma and her daughters. Sensing trouble, the hired photographer wisely stepped in and started lining people up for pictures. I managed to sneak in and get a couple of Fami and Thahmina and my nieces and nephew. But despite her best efforts, after awhile we all got a bit bored of waiting around. Sometime after Maghrib (the Adhan went at 8:25pm that night), the festivities finally started. The groom entered with his mother and sister, and he brought along a bunch of gifts for the bride (sarees, hijabs, shoes, etc.). Then, there was a big procession of the bride coming in with 4 attendants, and followed by a dozen or more of her family members, all carrying bundles of things for the groom: shirts, shoes, a guitar made from Ferero Rocher, all kinds of stuff. I shot all this with the X70 and had some trouble. I flipped it to Auto mode at one point, but that didn’t help much. It’s strange: the FG, in Aperture Priority mode, at f/1.8 and EI 320 handled the event mostly fine. Sure, the 50mm E has 1 1/3 stop advantage over the f/2.8 lens on the X70, but that should’ve been negated by the auto ISO. The main problems: 1) I have the auto ISO limited to 1600 and 2) I was shooting willy nilly, waving the camera around like a flag. I was being much more careful withthe FG. Shame on me: I missed a bunch of important moments due to careless shooting. Lessons learned: Take your time and have intimate familiarity with your equipment before shooting important, non-repeatable events! 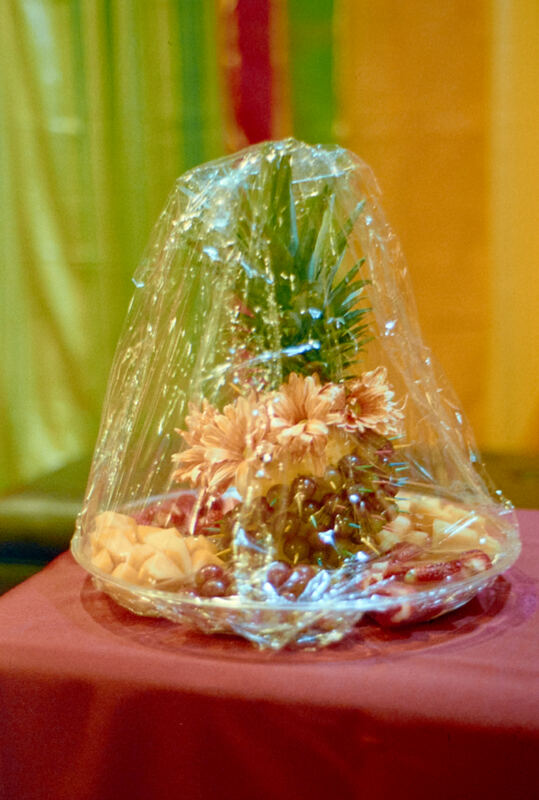 Anyways, I didn’t get a good picture of all the gift and all, but I got this great one of a fruit bouquet. I’m really pleased with that one, and I’m not too fussed about missing that part. After the bride came in, groups of people posed for pictures with the happy couple. 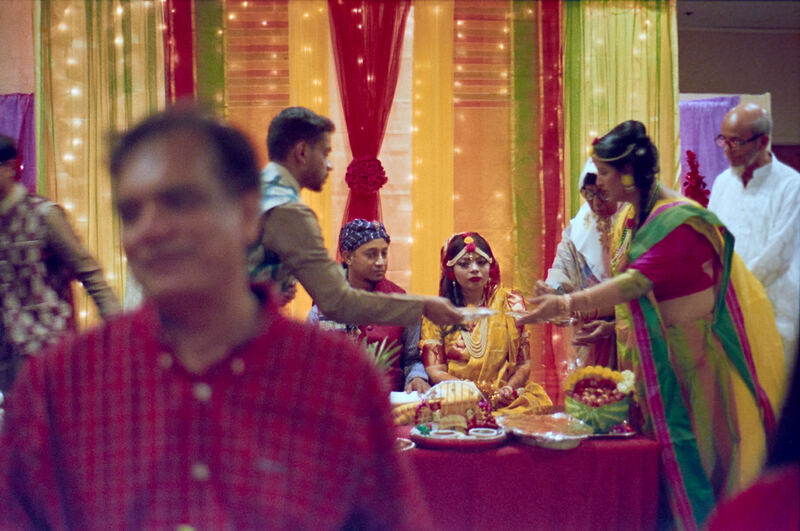 Given the very extended families in this culture (the groom is my mother-in-law’s cousin’s son) and all the people that brought cameras and wanted one with theirs too, all that took awhile. I shot with some enthusiasm for the first bit, but then realized that it was going to keep going and going, so I sat down and stared blankly off into space for awhile. And then dinner was served: an incredibly spicy goat biryani, spicy chicken curry (that served to cool my anglo mouth down after the biryani), incredibly spicy haleem, and a nice onion salad. The saving grace was the rice pudding for afters that helped cool my mouth, throat, and stomach. The Bengalis there didn’t have much problem with any of it. But then the entertainment started up. The little girl with the iPad above and her older sister sang a couple of Nasheeds, and a couple of the brothers-in-law did some dancing. If I hadn’t been such a stick-in-the-mud, my wife could’ve stuck around and enjoyed it, but Fami, Samie, Abba and I were ready to go, and so we went. May Allah forgive me for not being more considerate toward my wife. It didn’t occur to me at the time, but the whole affair, for me, illustrated the beauty of Allah’s words: we are put here to get to know one another, to experience what different cultures and societies have to offer, to share in their celebrations, to learn about them. I so often skip out on things like this, as I far prefer to spend time alone, writing for this blog, reading other blogs, playing with cameras or pictures, etc., and may God help me to remember His words and to take more opportunities to get out in the world and get to know other people, other cultures, other ways of being. Allah azza wa jall made us a rainbow of colors and He blessed us with different cultures, backgrounds, ways of living and moving through the world, attitudes, abilities, and He told us to get out there and learn. May He guide me to be better at that, ameen. And may He bless brother Rumman and sister Lisa with much peace and joy in their marriage, may He make them the coolness of each others eyes, and may He bless them with many believing children, ameen.